There were two of them. One white with fade flame points, the other black with brownish green eyes. Both walked with a sprain on their back leg. One on the left, the other on the right. Sierra took the white one home, and show him her container full of refreshments, and the black one not long after, as he followed Tabby in his quest to ask her hand. The white prince has a gentle voice, though straightforward, and stately hiding his line of Siamese. The dark knight hides his line of Siamese, but his voice wouldn’t lie. With the song that infused every meows, and the plenty of stories he told to her princess with the hair of gold. I can touch none. They would meow to me but won’t let me go near. They will let me stay close, but when I extended my hand, they would turn around. They know I understand. I gave them some space, I let them breathe and go on their own pace. They can take forever, though I think it wouldn’t go that long. I have nothing to worry about. There are enough food for everyone, and they don’t seem to mind my dirty front garden, lack of love, never kept. There is a house that will soon belong to a spoiled hillbilly brat who knows no manner across the street, and the dust and debris just went astray no matter how many times I tried to keep things in its prime. Sometimes those who build the house would park their vehicles too right across my fence, so I can’t go out and no one can go in. They are men, grown up men, so I took it they have all the intelligence they have boasted all around. I told them once not to leave their vehicle park barring my fence, and I know they understand. They choose not to listen, like grown up men, so I opened my fence anyway, and they have to live with many scratches on their pride, outside on their vehicle, inside when they remember a Chinese little girl took them up on their words and challenges, and they have nothing left to boast. Although I have never as joyous nor boisterous, I am grateful. First because I spent to board Tabby when I found her kicked around by an old traditional transport as she writhes in pain, eaten by scabies, second because I choose to spend more to fix her, third, and especially third, because she is alive. There were five along with Tabby then, in celebrating a nearby clinic anniversary. Only four came back alive, while Celia lost her life. 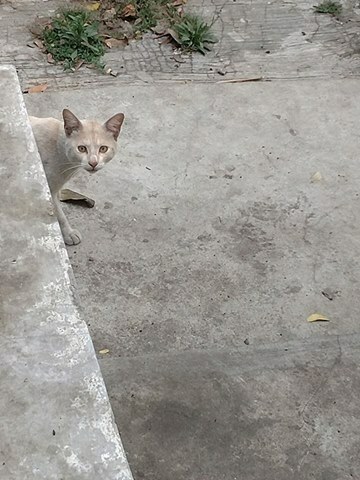 She was healthy when she came in, though a stray that I have kept since her kitten days, she was kept alongside sick cats stacked in a cage like meat market in Thailand. I was never told she died, and when I found out I was denied access to pick her up right away. Her carcass stored with the living overnight, on the floor, wrapped like bagel in a newspaper. When I eventually get my hands on her, the vet clinic charged me in full, to every single drop of Iodine. Those are far, far more than the price they promoted and claimed to include. While I have to be satisfied with a warning after my letter of complaint reach the head of Veterinarian’s association, I rejoice that four others: Tabby, Song Jo Na and Sibylle came out safe. Sibylle has to have her second surgery because her incision infected, Song Jo Na has intestinal infection in effect of the surgery. Tabby walked out free. I thought, it was luck that Karma had given her in exchange of her life as a street cat. But the peace of mind had to change then and there, because after I took a photo of her dark night meowing below my studio window, like Romeo calling Juliet, Tabby went down to meet him the next morning and roll on her back. She lets her dark knight rub her, she lets her dark night pinch her neck. That moment, the day that I have stacked carefully to work as smooth as it can shattered. The whole plan needs to change, and it need to change to incorporate my kitty ambulance vet picking her up for re-examination and I am almost sure to bet my head: re- spaying. The whole plan need to change, and it needs to change so that I can go back to different corners of town and pick up Song Jo Na and the others that went to the spay day with her for the same re-examination and possibly re-spaying. The whole plan need to change, and it needs to change to incorporate time to go to the bank to cancel my weekly savings toward our mortgage, and instead spend it on a job badly done. I need to change my pace, and I need it to change so that I can incorporate double the amount of schedules. I know it’s impossible, but I know no one will understand without a long story even if it dated not so long ago. I know it’s impossible. I know there will be plans that won’t be made reality, I know there will be promises I cannot keep, I know there will be yet another unbelievable story that makes people’s eyebrow’s knit. I know I am cursed, and no exorcism will alleviate all the suffering and distress that I have to drag behind me wherever I go, as long as I lived. I know I will be running late, and this particular night I am running so very late, there was no one left in the colony but the old tom who fell asleep in his faith on my coming. All in contrast to the numerous messages that keeps pinging on my phone. “Hi, I wonder if you have time this week? The company I worked for has new line of insurance…” When I said no, the group in which both of us Catholics belongs had a line of how arrogant Josie is for not setting time to meet even for a few minutes. “It has been two weeks since you placed your cat food order, can I expect your transfer tomorrow?” When I said not at the moment because they cannot offer other varieties like they promised, a line went on my cellphone demanding me to honor my part of the deal. Should I honor my part of the deal and eat whatever left of their stock when I know they are playing the same trick the others before me play? Say no new varieties or no new shipments so have Josie eat them all up and we switch to other brands and get her to buy that too because there is no choice. Another seller, blindsided by the glow and shine of my pennies, saw a big fat prey she has never seen before in her life, comes chasing me at the same time. She has been diligently sending me message offering this other brand or that other brand and tried to convinced me that it will safe me a great deal of money if I would buy her expired stock half the price. At other time she would ask whether I already transfer, and an hour later informing she is packing, an hour later asking if the courier choice is ok, an hour later saying she called the logistics and they will pick up soon, an hour later saying whatever, and yesterday asking if the delivery made it safely, an hour later asking if I am satisfied with the packing, an hour later telling me she included “a little bonus” in the sack, that turned out to be two sachets of Canagan. Then she was asking if there is enough for everyone and of course, an hour later it will be when I will be placing my next USD 600 order. A breeze of fresh air came from a friend in personal chat sending me blessings and peace, but few minutes later popped in a group chat saying that she and her darling will be ready for The Whiskers’ Syndicate‘s website starting tomorrow night. Would that work? Eh? Never mind. She wouldn’t understand and the whole story is too long to tell, and I am not wasting any second typing history. Let me see if I can run that far and that fast. I have one hour left of the day and three packets of orders I need to send out. Isn’t it good that the logistics I choose has a branch nearby open for 24 hours? My vet came fifteen minutes before midnight, and wasted no time jumping out of the car as she saw me trying to chase the dark night and the white prince. A few steps behind her, her husband joining the fray. In the middle of our Rodeo, came Phantom, him too knitting his graying eyebrow looking at the frenzy. And of course the white and yellow tom with chubby cheek and many scratches on his face but none on his back. The new champion that shares half of Phantom’s kingdom with Sibylle; then declared clear. And when I tried to catch my breath holding tabby in the middle of the road, while my vet fetch the carrier, came another one. White with yellow patches adorning his long, luxurious fur; his fluffy tail up high to the sky. He rubbed me once and he rubbed me twice. I know him and him too say hello to me for snacks once in a while. It’s just that this time he is thanking me for holding Tabby still for him. He is right. For two days since these two came by, there were fights every day, fights every night. There were screams everywhere. On the roof, in the community garden, at the sewer alley behind our house, in the front yard, across the street in the half built house, in the empty lot further beyond, around the block. Left and right, up and down. Half of the Syndi-cats got stressed, half other were pissed and start to fight among themselves, the other ladies screams and yowls for their share, and my house reeks urine and littered everywhere. It was a long breathe in silence as I waved my vet away, her car filled with a princess and her suitors, half an hour past midnight. We did not get the dark knight, who ran into a traffic light workshop near the garden, we lost the white prince, when he slipped under the bushes and none of us dared to go near because behind those little leaves is a ravine four feet deep. Cats treads on it, we roll our life into it. And yet when I turned around, to sleepy Hanshin (seen the scene too many times) and confused Sierra, and an irritated Phantom, there was smile on my face. We have many more trapped and fixed, and although it would mean no savings on the coming mortgage, maybe God will be merciful this time, and fill us in. I opened the front door and took another breath. Then I changed my clothes and walked out to the cattery, holding a brush and a bottle of bleach. The next in my schedule is half day late, but let’s see if I can run that far and that fast. I scrub and clean the house until four in the morning.